With Friday in full swing, it’s time to take a look at the starting XI for Gameweek 11 before heading into the international break. For my squad, it’s been a series of highs and lows through 10 weeks. Currently riding a green arrow (3 out of the last 4 weeks)l, I finally crept back inside 954k. Earlier in the week I put together a plan to get me through the holiday madness. This is the second week of that plan shifting my formation to include 5 midfielders. On the week, with just a FT, I took a -4 point hit in order to introduce Mohammad Salah. This on the heels of Gabriel Jesus (and Dale Stephens) out, in favor of Tammy Abraham. Both players will start in Gameweek 11. However injuries to Aaron Cresswell and Sead Kolasinac will see the tried and true, 5-2-3 fall by the wayside this week in favor of a more conventional, 3-4-3. 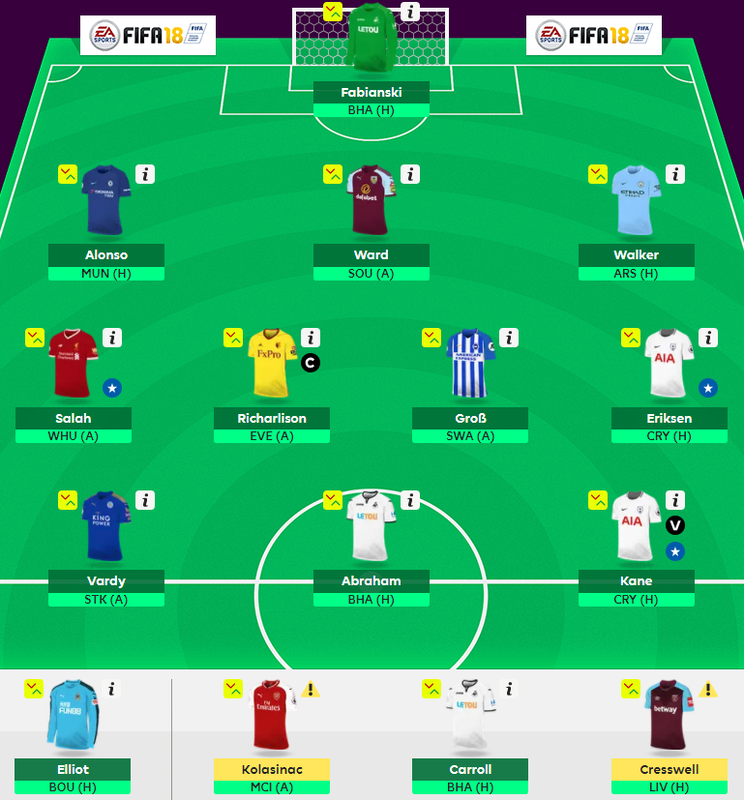 The squad and formation “feel right” as we look ahead to the start of GW11. The midfield is now anchored by two premium players, Christian Eriksen and Mo Salah, but you can’t discount the play of Pascal Groß or Richarlison to this point. Both “budget” midfielders have been top contributors on their teams when it comes to offensive points. All midfielders have favorable fixtures as well. Could prove to be a good attacking return in GW11. Defensively, it’s the first time I will feature three defenders, opting for a 5-man defense through the first 10 weeks of the EPL season. With Aaron Cresswell and Sead Kolasinac questionable, along with poor fixtures away to Man City and home to Liverpool respectively. A near fit Kolasinac, coming off a 14 point performance in GW10 faces a difficult test as the Sky Blues have posted 19 goals in the last 5 but Arsenal haven’t kept a CS in the last 3 weeks. Starting this week is Marcos Alonso, as Chelsea looked in poor form in their 3-1 loss to AS Roma this week in the capital city. With Jose parking the bus for Man United, we can only hope it goes the distance as a 0-0 draw. An out of form Lukaku with a struggling United midfield could mean Chelsea post just their second CS in the last 6 weeks. Stephen Ward gets his second call in the starting XI as Burnley face So’ton, just 5 goals in their last 5 games. It could be another close affair, but I am pushing for another lackluster offensive showing from both clubs in another 0-0 bore fest. Finally, Kyle Walker, priced at £6.5, he’s £0.6 more expensive the the popular choice, Nicolás Otamendi, walking the suspension tightrope with 4 yellow cards. He;s contributed 4 assists and 5 CS in his last 7 games. Between the pipes, it’s a toss up, as both Fabianski (home BOU) and Elliot (home BHA) have favorable fixtures. Up front will feature another first this weekend, starting 3 forwards; Harry Kane, Jamie Vardy and new boy, Tammy Abraham. Losing faith in Jesus, due to Pep’s rotation, has me reallocating funds to the midfield. I will be hoping the “Vardy Party” continues against a struggling Stoke City, off his first goal in the last 4 games. Abraham gets a spot start this week, but against Brighton, it could prove with a be a worthy challenge, although if he doesn’t return I won’t be surprised. While I am not having much fun playing the draft fantasy game, I continue to support my squad. Now up to 44 transfers in just 10 gameweeks, I continue to look for ways to improve my starting XI and strengthen my bench. I did make a few questions moves, picking up Zlatan Ibrahimovic, in order to play him later this season for United. He occupies a bench spot currently. Unfortunately, Philippe Coutinho still isn’t fit and is out for GW10. Toby Alderweireld also picked up a knock this week and the tough decision, what do I do with him? On the brink of the international break, I felt I needed one healthy body on the bench, just in case. I moved Alderweireld in favor of Kiko Fermenia and plan on starting him this weekend in my 5-man defense. I sent Fabianski on his way, introducing Nick Pope, who has played very well for Burnley in the absence of Tom Heaton. He’s got another favorable fixture away to So’ton this weekend. Defensively I could be burned, as I continue to start two Chelsea defenders, Caesar Azpilicueta and David Luiz. With any luck Chelsea play United to a 0-0 draw this weekend. We know Jose will park the bus, but United is struggling offensively, even in their 1-0 victory last week over Spurs. Arsenal have won 4 out of 5 with 2 CS against Brighton and WBA as they visit John Stones and Man City. Twelve goes in their last 5 games, Arsenal bring a strong attack to the Eithad, but feel confident City will prevail, not sure we see a CS this weekend. 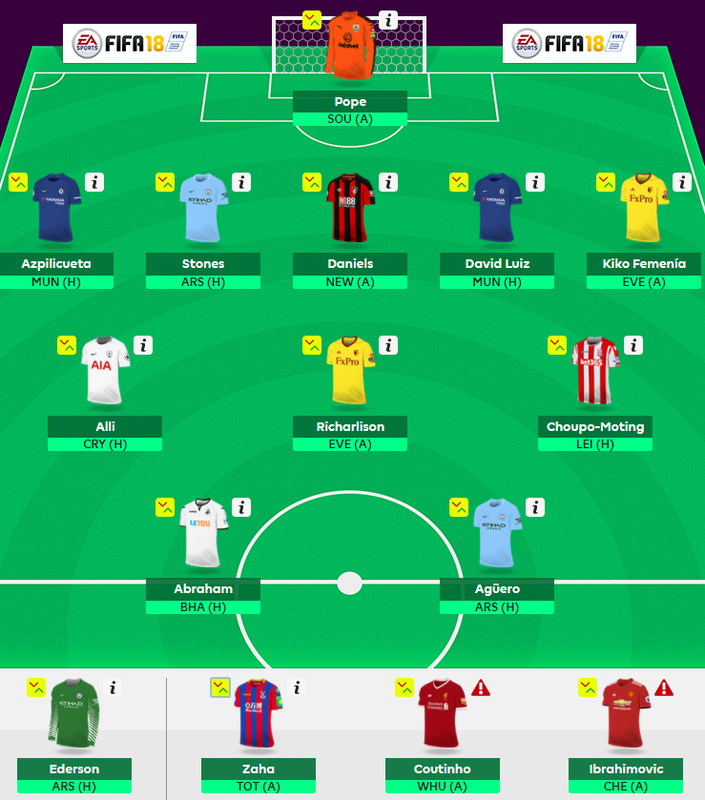 This week I brought in Charlie Daniels, as Bournemouth have a sea of green through GW16. While the Cherries attack has been struggling, Daniels appears to be primed for big potential. With no faith in Palace this week, I enlist new boy Kiko Femenia against a downtrodden Toffees team that is rudderless in the EPL. The injury to Coutinho means Dele Alli anchors the midfield against a struggling Palace team at Wembley. Off a brace midweek against Real Madrid, he could feature in this fixture. Richarlison, away to Everton has a great fixture, as he has been lights out away from Vicarage Road. The final piece of the 3-man midfielder is Eric Maxim Chuopo-Moting, playing in an advanced role, he faces a revitalized Leicester City. Up front, Kun Aguero gets a new strike partner in Tammy Abraham. While I am not sold on Abraham, he appears to be he best value at that price. I had considered Glenn Murray, but the return of Tomer Hemed could cut into Murray’s time. Abraham faces Brighton at home this weekend. It’s a good mix of players making up my starting XI. The return of Coutinho, hopefully after the break can only strengthen my squad, which is still chasing the top spot in the 8-team league. 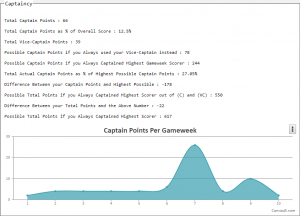 Last season through 27 gameweeks I posted an article titled, Captain’s Armband, which highlighted my failures to tap the correct player. Last year, by appearances I was always off a week when handing the captaincy to Alexis Sanchez. While he wasn’t the sole reason I struggled over the 38-week season, it was a contributing factor to my demise. This year, selecting the correct captain through 10 gameweeks has been the difference of being in the top 10k or hovering around 1 million. Even the pundit sites haven’t been spot on, case in point Sergio Aguero in GW10. Tapped by two sites I follow, Aguero didn’t feature in the 3-2 victory over WBA. Yet, it’s been Harry Kane, the biggest loser when it comes to captaincy points. Voted as the best option for the captain’s armband in 3 of the first 10 weeks, Kane went on to disappoint fantasy mangers, returning in none of those games. For me Kane has been the cause of my frustration. Unable to get the “monkey off his back” in August, I stuck with him, when Lukaku was showing promising form. His fortunes turned the following month recording 3 double digit hauls out of 4 games. Votes from the pundit sites saw Kane’s popularity slip during September, as he was handed the armband in GW5, but failed to return. However, Lukaku (twice) and Aguero both delivered during September as voted on by fantasy managers. Kane’s underlying statistics were the talk around fantasy, but his inability to score at Wembley against lower league opponents were a cause for concern. Fixtures against Burnley, Swansea City and Bournemouth saw Spurs victorious, but Kane didn’t record any attacking points in the EPL. Champions League was another story at Wembley, recording 5 goals and an assist, further promoting him as the “in form” forward. His home FPL form was revitalized after a 4-1 thrashing of Liverpool at Wembley, hitting for 2 goals an assist and 3 bonus points for 13 points. In fact his September form saw him record 11 goals and 1 assist during the month. At this point at £12.5 he was becoming essential in the starting XI. At that price point, it was argued that he should be leading the league in scoring, but based on current form, his dynamic performances and explosiveness, Kane’s form was nothing short of impressive. Through 10 gameweeks my captain selections have netted only 66 points, representing just 12.5% of my overall points (589). Based on statistics at FPL Statisco, if I always captained my highest scorer I would have 617 overall points. More importantly, if I averaged just 10 points a week on my captain selections, my 954k overall rank would be nearer to 1k! Captain selection this season has been the difference to start the season. Looking ahead Kane is going to feature as my main forward with excellent fixtures through Gameweek 24! Only testing fixtures, away to Arsenal in GW12 and away to Man City in GW18. His midweek UCL performance in a 3-1 victory over Real Madrid has Kane poised to be the unanimous captain selection moving forward. The only challenging fixtures during this run are away to Arsenal in GW12 and away to Man City in GW18. He’s poised to kick things off this week at Wembley against a struggling Crystal Palace.